(Or How To Take A Flop And Make It Awesome). So, a few days ago, I was totally excited about making roasted cauliflower hummus. You take your basic hummus recipe, and substitute a head of roasted cauliflower instead of chickpeas. It looked so promising. Diligently, I chopped my caulifower, tossed with 2 tsp of smoked paprika and 1 tsp of cumin, some olive oil, salt. Roasted it for 25 min at 350. Threw it in the blender with 1 clove of garlic, 3 tbsp of lemon juice, and 1/4 cup tahini sauce. I expected a miracle. Um. Not so fabulous. I mean, it was just hummus. It was ok. It would have been waaay better with yogurt, but, I’m dairy-free. So, about 2 cups of this stuff sat in my fridge and I just couldn’t bring myself to throw it out. And theeeen. 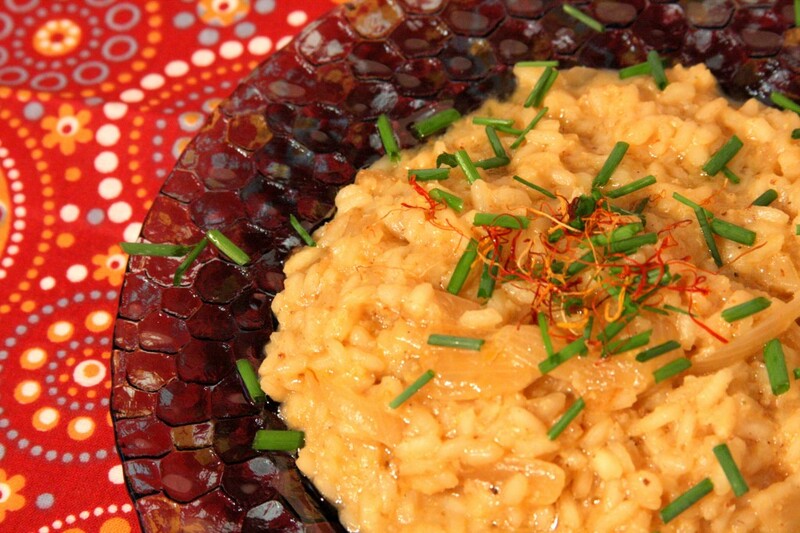 Then I saw a recipe for roasted cauliflower risotto in Jamie Oliver’s book Jamie’s Italy. (I read cookbooks the way I USED to read proper literary, postmodern, magic realist novels. Um. In another life.). Anyhow, I realized that I was on to something here. A basic risotto with this cauliflower hummus would be delicious! So here it is. Creamy, thick, hot and you could never tell there’s no dairy. Prepare the cauliflower hummus as outlined above. Put the chicken stock on to boil. (When it reaches boiling, turn it down to simmer). Chop the onions, saute in a hot deep pan with olive oil, till they start to brown (to yur preferance. caramelizing is fine too). Add in the rice, and coat in the mixture on medium heat. While stirring, add in stock, ladle by ladle. Add in new stock only when the first ladle-ful is absorbed. In between adding in the stock, you can add in spoonfuls of the cauliflower hummus and your pinch of saffron. Don’t drop it in all in one clump if it is cold, or else the rice will stop cooking. 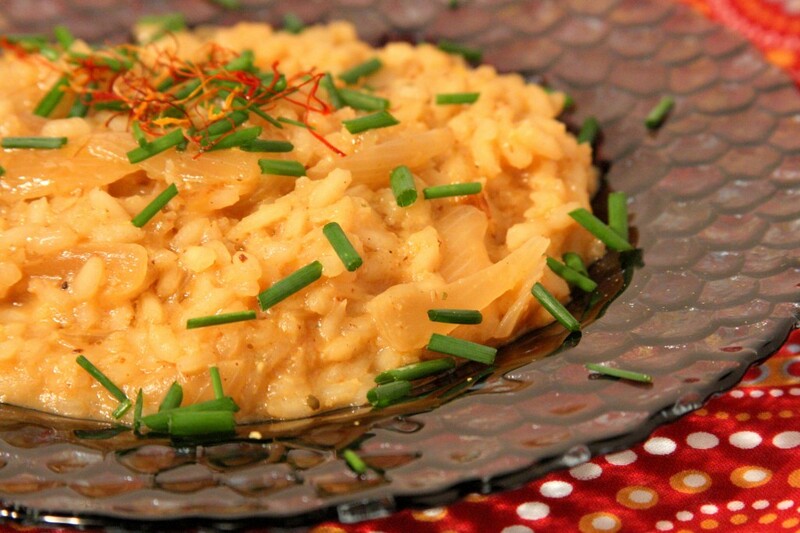 The risotto should be a touch runny and a touch chewy or uncooked in the middle (but not crunchy!). This is because once you turn off the heat, the rice will keep cooking and by the time you serve, it will be fully ready. For each serving, (about 3/4 cup), add about 1 tbps of nutritional yeast, or parmesan cheese.